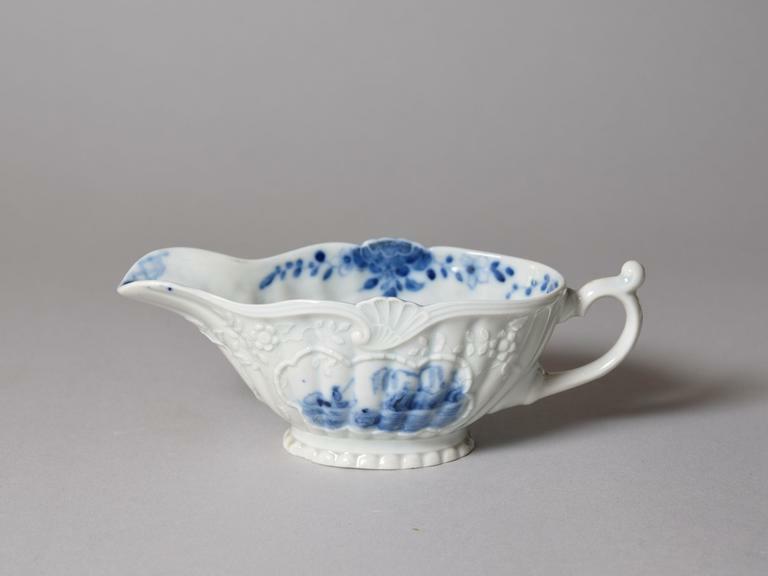 Sauce boat of porcelain, moulded in relief with gadrooning over which are flowers and foliage and raised lines outlining panels, in which are painted in underglaze blue with blurred landscapes in Chinese style; scroll handle, and scrolled edge moulded with shells. Nicholas Panes, British Porcelain Sauceboats of the 18th century, Wales: Gomer Press, 2009. See p. 134, fig. 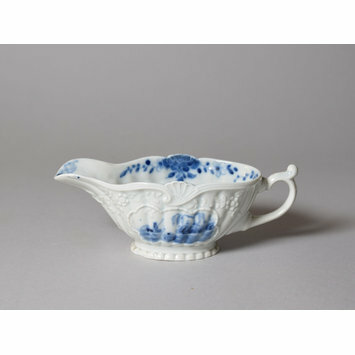 213 for a Worcester sauceboat of very similar type painted with the 'Moored Boat' pattern, c. 1735. 'Sauceboats of this size were copied in the 19th or early 20th century in continental hard paste'.